Still Plays Video Games: Gaming Companies, Don't Let This Be You! Yes, we are horribly and some say, unreasonably, critical of these companies that work hard to provide us safe, fun video game entertainment. We believe though, that it is unreasonable to release a product that if it were an automobile would certainly be recalled for safety concerns, to the public for consumption. Online gaming is a "Booming" marketplace, many are jumping into the "gold rush" of profits to be made by crossing digital toys with physical ones you can pick up at your nearby toy store. Nothing however, destroys a kid's (or a big kid's) enjoyment of a game when it's infrastructure can't deliver. 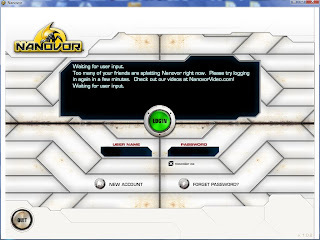 No, we're not just picking on Nanovor, we love the game around here, but we want to see it better before it goes much farther towards the, "Great game Joe, but I could never log in. ", road.